This One’s for the Moms! It’s Time to Make Time for YOU! 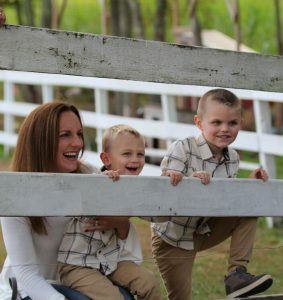 Whether you are a stay at home mom, a full time working mom, have round the clock help, or do it all by yourself, the word “MOM” is synonymous with BUSY. Not many can argue that fact. Being a mom means being busy. Plain and simple. They take up So. Much. Time. Riddle me this: Out of all the hours in the day that you spend doing, or planning things for your kids….how much of that time goes back to you? Now I’m not talking about sleep (Is that even a thing?) or the occasional date night or girls night out or that one time you were able to attend book club but basically hid in the back because when were you supposed to have time to read a book? No, I’m talking about time actually devoted to MOM. Mom’s health, Moms wellbeing, Moms strength and stamina? Sign up for our free newsletters and get more DHAC content like this delivered right to your inbox each week! I have been in the fitness industry for over 13 years and I have become a pro at calling people out on excuses. I know that life is busy and coming to the gym every single day is just not feasible for everyone, but to NEVER exercise? We need to take a look at our busy lives and be sure that NEVER exercising is NEVER an option! It is important to make the time for exercise and make exercise a priority in your schedule. Exercise can be done for many reasons. Some exercise to lose weight, some to prevent weight gain. Others are rehabbing an injury or training for a race. There are people who do it just for the aesthetics, and there are people who just plain enjoy it! The bottom line is that everyone has a reason, and whatever that reason is….it’s YOUR reason! Make that your motivator to make time! Coming up with a reason to workout will empower you to find the time. The scary part is that if we ignore the importance of exercise and never make time for it, we most likely will have to make the time to be sick, injured, lethargic, and potentially overweight. Those will all take up more of your time than you ever intended. So the next time you want to come up with an excuse as to why you can’t exercise at all this week, remember that you have the time. You just need to set it aside. I am a full time working mother, wife, and homemaker. Any way you look at it…I’m busy! Very busy! I find the time. I make it work because I have to. I am not superwomen, and I do not have superpowers. But, I have a 9 month old son who is my reason for waking up every day. I want to wake up feeling as strong as superwoman, because to my son, I am a superhero and I intend on keeping it that way. Find your reason and make the time. Life of Sarah C: N is for Not Enough Time! Lately there seems to be some sort of disconnect between me and the universe. I am spinning my wheels and getting, well….nowhere! It’s one of those times where I need to check in with myself and take the proverbial “chill pill” because it’s either that or I start to look like a crazy person! Some may think I’m too late because on occasion I do sport that look! During my staff meetings I am constantly telling my staff to manage their time. Book your lunches, tafke your breaks, and arrive at work 10 minutes early to wrap your head around your busy days. It’s February and we are very busy at DHAC. It’s a dream for the exercise physiologists in us, but as people, it’s a bit of a challenge. Remembering to ‘practice what you preach’ can be tough! This week I promised myself I would! 6am – Nico is awake! 8:35am – I take a 90 second shower (or so it felt like), make a weekly menu and coordinate a shopping list. 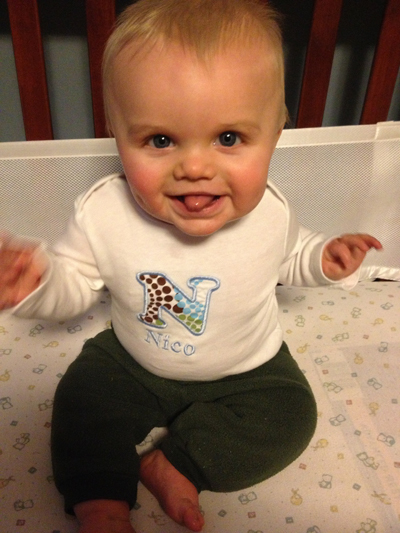 9am – Nico wakes up….kid is SO not a napper! 1pm – Get home and feed Nico lunch ***Public Service Announcement**** Don’t wear nice clothes when feeding your child spinach and pears because at that moment, he will enjoy doing raspberries directly towards you! 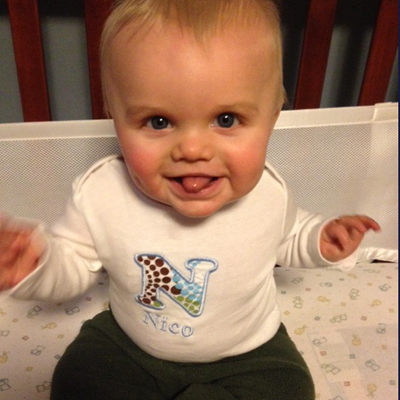 2:30pm – Change Nico’s outfit because he spit up ALL OVER IT! 3pm – rush to get Nico in the car seat because he is EXHAUSTED. 3-4pm – Drive around aimlessly because Nico fell asleep and trying to sit him in the carraige at the grocery store tired, well—that’s an entire new blog! 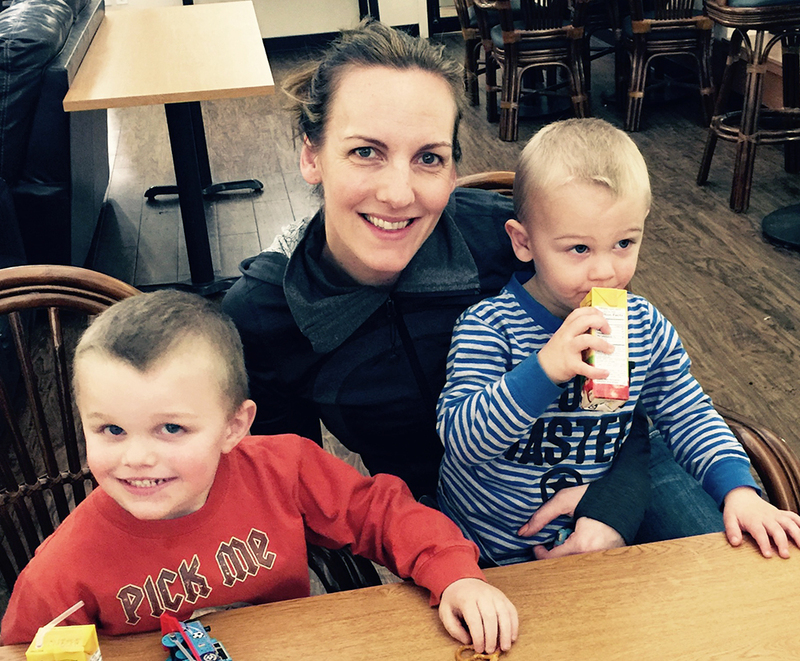 4pm – Nico does amazing in the grocery store and we have a bit of fun! As crazy as my day was, the most vital part of my day was what happened at 8:35am. Yes, showering is important BUT….more importantly I set a plan for the entire week for meals. Whether you are trying to lose weight, trying to be a good parent, or just trying to eat healthy, preparation is THE single most important thing you can do. Remember N is definitely stands for ‘not enough time but P stands for Proper Preparation Prevents Poor Performance. I am 100% prepared for this entire week’s meals. So now…N is for Nico! Life of Sarah C: Happy New Year! No matter how prepared I am, I always find myself rushing around during the holidays. There is always one more gift to buy, one more dish to prepare, or one more room to clean. I try to practice what I preach and just take it slow and catch my breath once in a while. It’s not always easy. This Christmas proved to be especially more stressful than ones past. Having a 5 month old is certainly a game changer. Since all of my tasks need to revolve around his timeline, I had to adjust my normal holiday routine quite a bit. Unfortunately, I let it get the best of me. I am not a big New Year’s resolution type of person, but this year I am going back to the basics and slowing down a bit. During the past few weeks, I was consumed with rushing around and letting the stress get to me. I was stopped in my tracks when hearing about the tragedy at Sandy Hook Elementary School. I was quickly reminded of just how short life is and how important it is to slow down and remember what is most important. The day of the shooting had me wanting to go home and just hold my son in my arms and not care about anything else that needed to be done. I did just that. I was feeding him when something happened that made me put a lot of things into perspective. Nico was in his high chair enjoying some mushy green peas. He was full of laughter and funny faces. I was soaking in the moment and for once, did not care about the pile of laundry that needed to be folded or the sink full of dishes that needed to be washed. 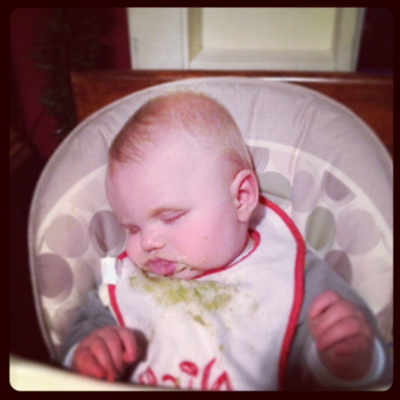 Suddenly, still in his high chair and covered in peas, Nico fell asleep. This 5 month old boy just stopped what he was doing and fell asleep. At first I was confused but then it dawned on me that he had taught me a huge life lesson. Prioritize. When one thing is more important than what you are doing, do it! At that moment, Nico knew that sleep was more important than finishing his peas so he did just that! I was so happy that I ignored my housework and experienced that moment. Had I not chose to ignore my chores I would have missed it all. I know that I won’t ALWAYS be able to do what I want when I want. But in general it was a good lesson. Priorities differ vastly from person to person. All I ask is that you take a moment to really think about what is most important to you and always make time for it. Smile at the little things once in a while and when stress starts to get the best of you, remember that life is short. Focus on your happiness and rid your moments of stress. The picture you see with this blog from that very night and that’s what I will use to help me remember to slow down and prioritize. Workout when you need to workout, eat when you need to eat, and of course do as Nico did and just sleep when you need to sleep! From my family to yours, have a very Happy New Year full of laughter, memories, and stress free days.